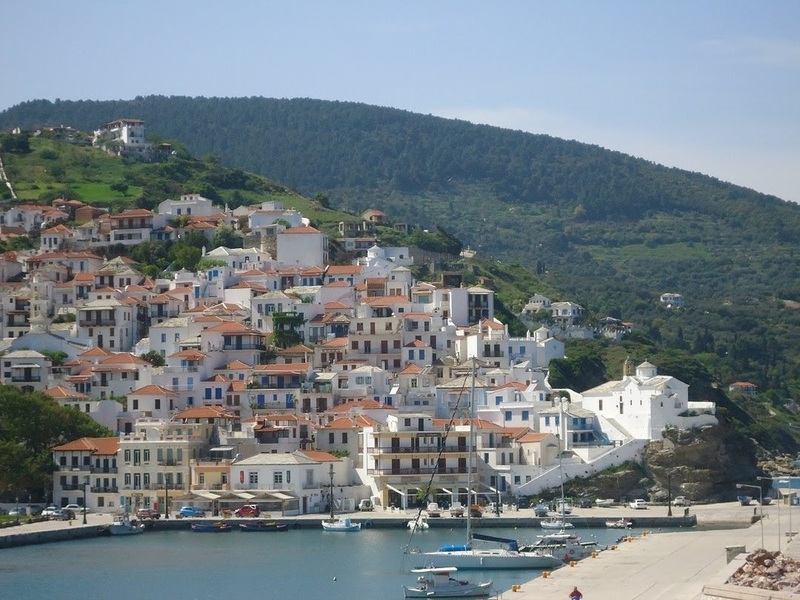 ﻿Skopelos is the greenest island in Greece. 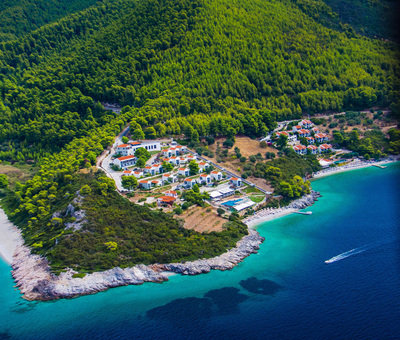 Here, where the green of the pines and the thick forests meets the deep blue of the sea and the sky, creating an image of incomparable natural beauty, the visitor will find himself in an idyllic place, a small paradise in the heart of Greece. The island of Skopelos is characterized by its dense forests and the blue of its seas, and this is why it was formally declared a green and blue island. Skopelos is the capital of the island group of Northern Sporades, and the second largest island in the group (following Skyros). Beaches in Skopelos are known for their crystal waters and the marvelous green landscape that surrounds them as well as the fact that they are surrounded by countless pine trees. 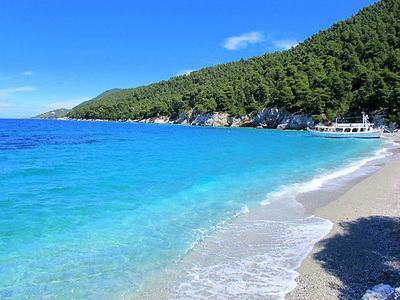 Each beach on Skopelos is unique and has its own beauty. Most of the beaches are situated at the southwestcoast of the island.The area around the island is attractive for people that have a boat for the wonderful isolated beaches. By car, motorbike or the bus that does the route Skopelos to Glossa, you will find the immense Milia, the little Antrines, the unique Kastani, Chovolo, Limnonari, Stafylo and Velanio, one of the most beautiful beaches on the island, which continues to gather unrepentant nudists and those who can bear the walk. 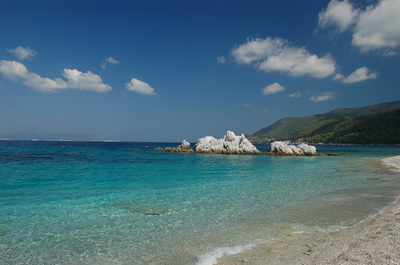 ﻿Skopelos is located between the islands of Skiathos and Alonissos . 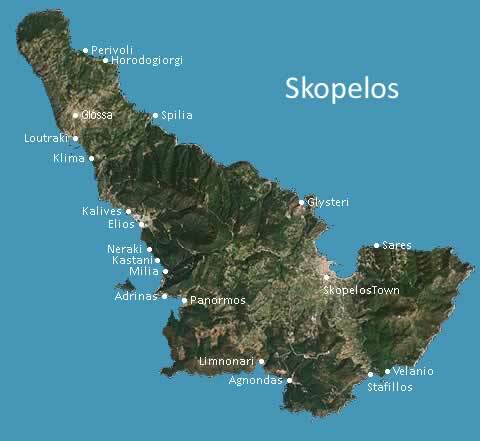 Skopelos island is 60 nautical miles from Volos, 61 nautical miles from the port of Agios Konstantinos, 45 nm of Kymi (Evia ) and 120 nm from Thessaloniki . 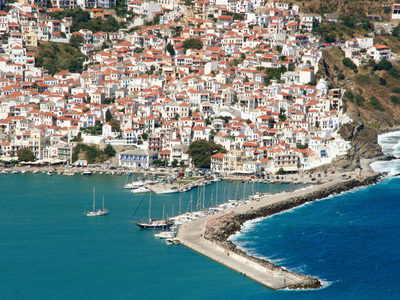 The island has three ports . The main port of Skopelos (Skopelos Chora), Loutraki port ( Glossa’s village port ) and Agnontas port ( used during days with strong north winds which hinder the ships to reach the port of Skopelos ). 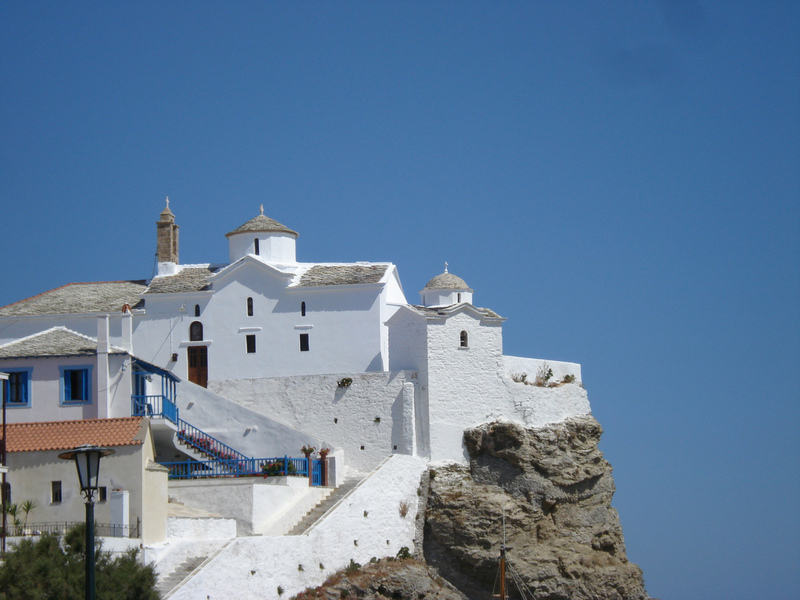 There is a ferry service to the island all year. 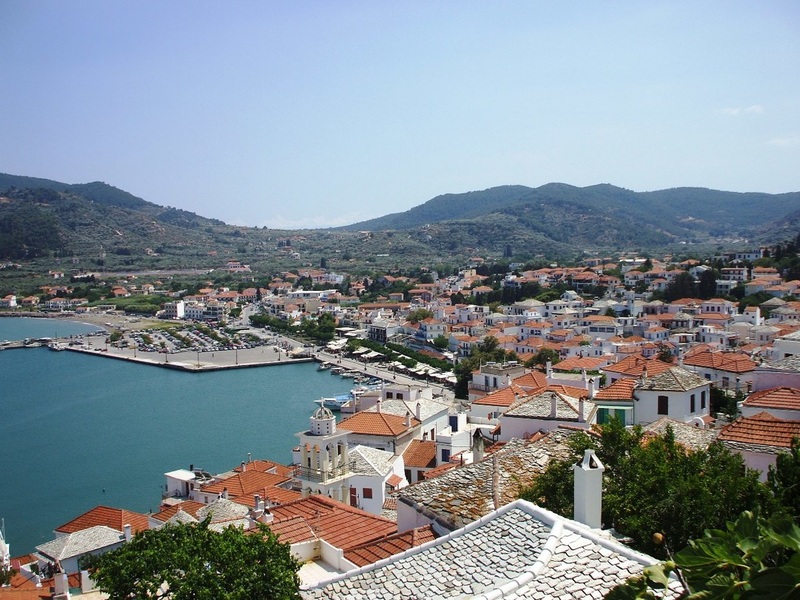 This makes getting to Skopelos quite easy. 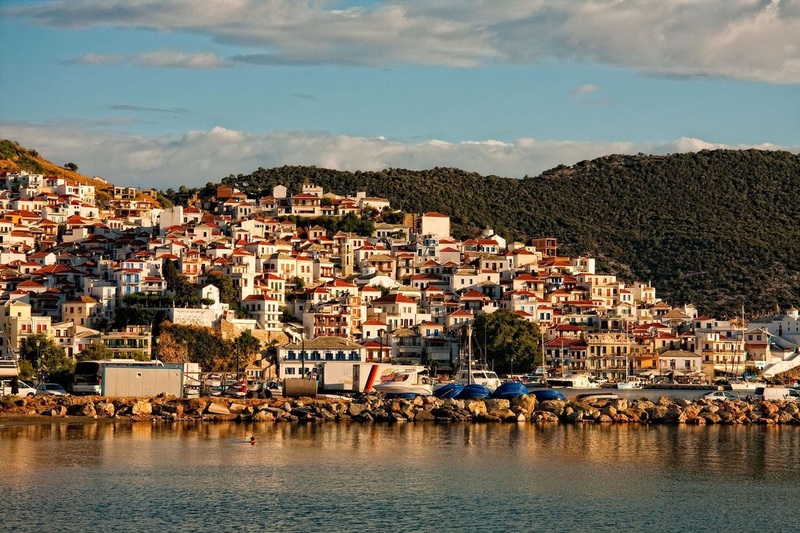 Most ferries depart from the city of Volos daily. 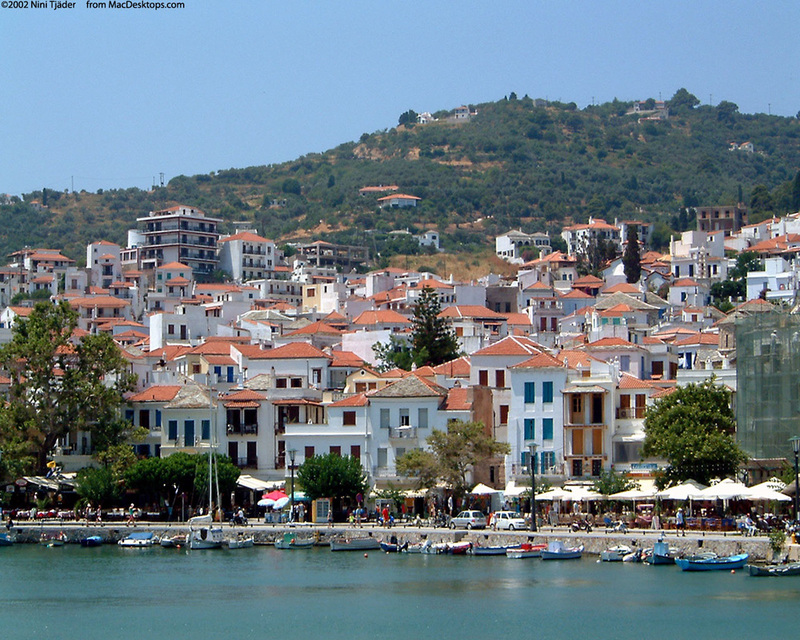 They call at Skiathos, Glossa (Loutraki port), Skopelos town and Alonissos. During the summer months ( May – October) there is an increased service. Extra ferries sail from Aigos Constantinos, Kimi and Mantoudi. Kimi and Mantoudi are ports on Evia. All the ports can be reached by bus or car.